As a family we were attached to the Union Chapel, Berkeley. I remember attending the infant class where we were taught words made by the assembling of single letters which were made to slide into place on the inside […] The infant class was held in the vestry which was then a large room at the rear of the chapel […] (p.89). Frank writes a great deal about the church and worked as a Sunday School teacher for over 50 years of his life. He was a founder of the Sharpness Union Church, and worked there as a Sunday School teacher once it opened in 1880 (pp.157-8). On 29 Feb. the first Communion Service was held and at that service I was amongst those received into Church Membership. I remained a member until Feb. 1932 when, with my wife, I was transferred to the Church at Old Town, Wotton-Under-Edge. 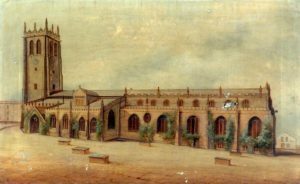 From the latter we were transferred on 4 March 1934 to Southgate Congregational Church, Gloucester. From the first I took an active part as a teacher in the Sharpness Union Church Sunday School […] (pp.158-9). Father & Mother attended the Berkeley Union Chapel and, of course, took us children. Allan and I went to the Sunday School. I can just remember the infant class to which I belonged at first […] later I was passed on to boys classes. One teacher we liked was a Mr King, a blacksmith of the town […] Another minister we greatly liked was the Rev. George Robinson, a sensible, jolly man whose hearty laugh at a joke did one good. I was envious of Allan when he was put up into Mr Robinson’s bible class and hoped I should soon be old enough for the same. (pp.128-9). Frank attending a Sunday School as a child and young boy would have contributed to his interest in teaching at a Sunday School, as he would later go on to do this for the vast majority of his life. The Sunday School also would have contributed to Frank’s “personal faith” (1999, p.239). 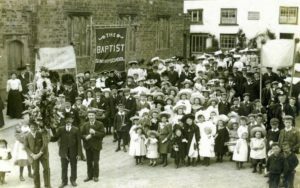 “Baptist Sunday School, c.1900”; Hatherleigh History. Frank also recollects about “Treat days” at the Sunday School (p.91). An event in which everyone would march out to the fields holding decorated banners (p.91). Frank writes a lot about different types of marches and events in his memoirs. These will be detailed in part two of my ‘Fun and Festivities’ post! One of my chums, Will Ayliffe, and I, were each down to give a recitation. I was so proud because although he was only about three months younger than me, he was picked up and stood on the table to give his verses, I, who came next, was permitted to remain standing on the platform during my declamation! It was little to boast about, and it may have been that no-one troubled to ensure that I should be seen all down the room but it shows how children are impressed by little things! (p.55). The Band of Hope was a children’s organisation that focused on helping children grow into respectable members of society. The Band of Hope emerged from the Temperance Movement – a movement that helped to combat drinking problems: “To many families the movement was a new children’s version of the old self-help tradition of the working-classes” (1973, p.50). Clearly, Frank’s parents wanted him to learn life-long values and to stay away from trouble, as Lilian Lewis Shiman notes: “[The Band of Hope] played an important role in introducing socially acceptable ways for children to spend their time” (1973, p.51). Another author on the Writing Lives website, Joe Ayre, also attended the Band of Hope. Sadly, Joe appeared to have had a more negative experience while attending the Band of Hope. As stated by Luke Beighton, Joe found that the Band of Hope punished those who did not attend regularly, by not allowing them to attend the “summer celebratory picnic” (Beighton, 2018). Frank’s recollections, however, do not seem negative. Instead, Frank’s recollections are thankful, as we can see from this quote about his recitation: […] I have ever felt grateful to whoever set this for me to learn as the sentiments therein expressed became my fixed resolve and have been carried out to my lasting benefit and, I hope, to all my family (p.56). One of the enterprises of the Band of Hope was a Drum and Fife Band which I was permitted to join, my instrument being the triangle! (p.57). 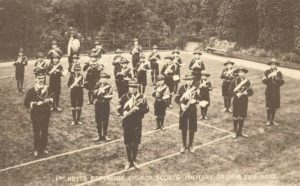 “1st Notts Battalion Church Scouts Military Drum and Fife Band”, 1911. We can see in this quote below evidence of Victorian Sunday School activities. In addition to supporting organisations such as the Band of Hope, many Sunday Schools also supported activities such as “class teas” and “picnics” (Laqueur, 1976, p.249). After we had attained a certain amount of proficiency various times were spent in “marching out.” In the summer we played at the Union Chapel Sunday School […] which was held at “Walgaston”, the farm residence at Mobley of Mr Thomas Bailey. Tea was partaken on the lawn. During the tea the band played selections which necessitated our not sitting down to the meal with the other boys of our age but having tea afterwards all by ourselves! We felt we had earned it! (pp.57-8). The next post will be about the ‘Fun and Festivities’ that Frank writes about in his memoirs! If you would like to look at other interesting ‘Habits, Culture and Belief’ posts by other authors, click here. Beighton, L. (2018). Joe Ayre (b.1910): Education and Schooling. 22 March. [blog]. Available at: http://www.writinglives.org/education-and-schooling/joe-ayre-b-1910-education-and-schooling (Accessed:11/04/18). Burnett, J. Useful Toil: Autobiographies of working people from the 1820s to the 1920s. London: Routledge, 1994. Horn, P. Pleasures and Pastimes in Victorian Britain. Gloucester: Sutton Publishing, 1999. Laqueur, T, W. Religion and Respectability: Sunday Schools and Working Class Culture. London: New Haven, 1999. Marling, Frank George. ‘Reminiscences’. Burnett Archive of Working Class Autobiographies. Brunel University Library. Special Collection, 1:492. Shiman, L, L. ‘The Band of Hope Movement: Respectable Recreation for Working-Class Children. Victorian Studies. (Sep, 1973). 17(1): pp.49-74. ‘Baptist Sunday School’. (c.1900). Hatherleigh History. [image]. Available at: http://www.hatherleighhistory.co.uk/2015/baptist-sunday-school-c-1900/ (Accessed:10/04/18). Gilbert, Albert. ‘Parish Church’. Calderdale Metropolitan Borough Council. [artwork]. Available at: http://www.artuk.org/artworks/parish-church-21150 (Accessed: 08/04/18). 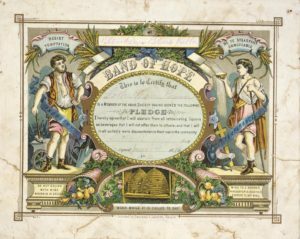 ‘The Band of Hope Temperance Society’s abstinence pledge card from 1888’. Ministry for Culture and Heritage). [image]. Available at: https://nzhistory.govt.nz/media/photo/band-hope-no-alcohol-pledge-card (Accessed: 09/04/18). ‘1st Notts Battalion Church Scouts Military Drum and Fife Band’. (1911). Ibew. [image]. Available at: http://www.ibew.org.uk/vbbp-uk1.htm (Accessed: 09/04/18). 2 Responses to "Frank George Marling (1863-1954): Habits, Culture and Belief"
What a fascinating post! It is nice to see comparisons with our authors, mine too had parents that wished to encourage activities such as attending church! Thank you for your comment! That is very similar to Frank and also very interesting! It suggests that there were many people who wanted to practice and teach respectable values to their children, such as going to church.